The accusations of "trolling the userbase" aren't entirely unfounded, though. It's an issue that users are genuinely unhappy with, and this tool comes a cross as a bit of a Rube Goldberg solution - a much more complicated answer than just letting the users make their own decisions around when to suspend. This tool seems like a taunt to all GNOME users that are unhappy with the default lid close behavior. No, we're not going to allow you to adjust the basic system behavior to your needs, we'll mock you and provide you with some ridiculous application that you need to use. Really, this doesn't help the GNOME developers PR at all. This must be some sort of a joke. Why if there is an option in Gnome-Tweak-Tool to disable suspend would you spend time and efforts on this stupid solution rather than spending some time integrating what Gnome-Tweak-Tool provides with Core Gnome System Settings options? Haven't you though that if somebody wrote Gnome-Tweak-Tool with those options (that were missing in Gnome 3.0+) is because real people, who use their computers for more than just showing how beautiful Linux looks, need those options? Now that you found out (took you some time eh?) that people actually need to close the lid without suspending the laptop, you rather write a stupid alternative than swallow your pride and accept that it is a feature that should have been included as a default option in Gnome? I don't dislike this app, as it can be handy sometimes, but the problem lies elsewhere. Some devs should stop thinking that removing options is a feature. Yes, provide good defaults first, but let users configure their system. Provide an easy and uncluttered way to configure it, not just remove options completely. To everyone who's unhappy about the lid-close defaults and/or options: This is an entirely different thing from a system setting (and if that setting makes sense to have in gnome-tweak-tool or system-settings are outside this discussion). For my work laptop, I want to suspend on close 99% of the time I close the lid, but sometimes I need to run to meetings without losing the IRC network connection. This app is for that. Going into the control center and changing that every time sounds like a lot of work. Plus, if you have to change the setting temporarily just so you can close the lid once, it's easy to forget to change it back. And then you close the lid, forget about the setting, and have the laptop overheat in a backpack. Incidentally, why the systemd requirement? I thought freedesktop had a standard DBus method for suspend inhibition? @Andreas and others: I'm glad it matches your use case, but there are lot of other use cases for inhibiting suspend. If I put away my laptop, but want my bittorrents to continue, I now have to run an application called "Office Runner". How do I explain that to other people? "There are some people that like to run to an office meeting with their laptop closed without it suspending, so that's why I have to run 'Office Runner'"? That doesn't sound very logical at all. It is a fun application, but I do really hope there will be another way to inhibit suspend in GNOME. There's a couple of incorrect assumptions I can see being spread in the comments. We've already explained that, for this particular use case, having to go in the preferences to change it, and then change it back just isn't practical. Having something separate is needed. Whether it's this application, or an extension, it doesn't really matter, it's just one more choice. Juan: gnome-tweak-tool's settings are implemented where? In gnome-settings-daemon, which I maintain, and had a lot of bugs related to behaviour with lid close (which also means problems with locking, blanking when inhibited, etc.). Having options for this isn't free. There's around 4000 lines of code dealing with this, and it was full of bugs. 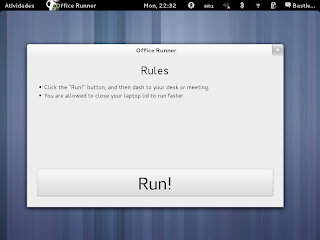 As for the fact that it took me some time, the original post about Office Runner is from 2011, before the release of GNOME 3.2. We knew it was a problem, and it's a shame people didn't fix applications instead of posting snarky comments on blog posts. Marius: we use systemd's APIs directly in this case, though we could have used gnome-session's API. But that's only implemented for systemd. So no difference really. Walther: Inhibiting suspend should be the application's job. I would certainly expect a good GNOME Bittorrent client to allow you to say "don't suspend until this is downloaded, or seeded to that amount". There's also command-line tools to do that (gnome-session-inhibit, and systemd-inhibit). Office Runner runs for 10 minutes maximum to avoid the case Marius mentioned. And if you really really don't want to suspend on lid-close, ever, you can edit /etc/systemd/logind.conf and set the lid close to not do anything. You get to keep both pieces if things break. Hello, I have been using the application to replace the option of doing nothing after closing the lid of my laptop. However, I use it for something other than to move to place with my laptop. Could add an option to set the time limit?, Currently only works for 10 minutes, and I use it to listen to music with closed lid of the laptop. I did not find the application in gnome bugzilla.